There is a house in our neighborhood that recently started some home improvements. After replacing some of the exterior of the home to a beautiful stone (they did it themselves), they began working on some project in the front yard. We had a hard time telling what it was- it looked like it was going to be a firepit or... who knew? It ended up being a very pretty fountain. 2 children at the top, holding an umbrella. Water trickled from the umbrella, down the levels of the fountain. We've hit a cold snap around here. 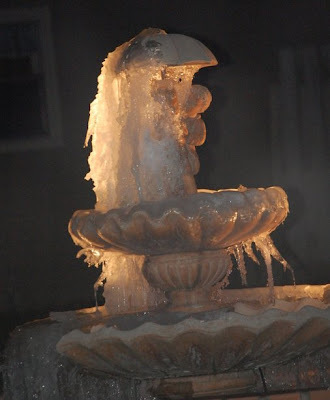 And the fountain, which is beautifully lit at night, was left running and the running water has frozen. I think it is beautiful. It does look quite gorgeous, ice does such lovely things sometimes. Kind of like a fast version of limestone cave formations. Though I can't help but look at it and wonder if the pipes are intact, don't bad things happen to pipes if water freezes inside them? The picture is amazing ... it looks like a Jellyfish!!!! I love this!!! I'm also hoping that the pipes haven't frozen or burst... I guess we'll see once things thaw! Cooking with Liz: You Name It! Are you American? Did you vote today?